Yesterday I got to spend the day with my boyfriend’s family, and it was such a fun day with them (and full of delicious food)! Palm Sunday has always been a huge celebration for his family, and I feel so fortunate to have spent the day with them. I wish I would have been wearing some of my spring picks, but what can you do when it is 40 and windy on April 13th?! This is my second basic piece from Front Row Shop (see my first review here) and I am still impressed. This shirt is a great basic, high quality, soft and warm, and has an amazing sheer detail on the top. I love when you can buy basics that have a unique detail like this. And even with the sheer top, it is still appropriate for work! I would pair it with a blazer and/or with red slacks for a nautical vibe. 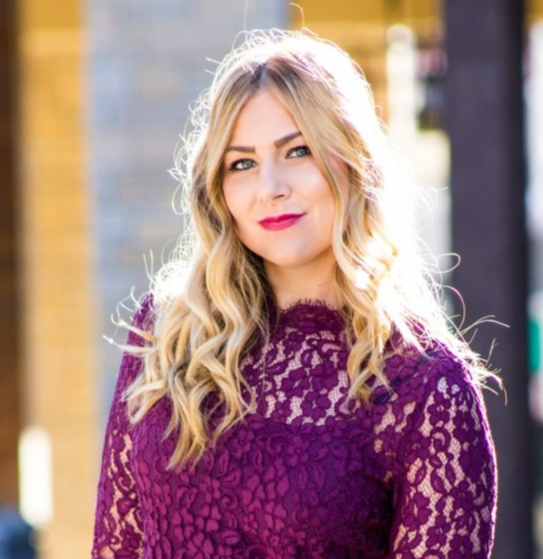 Stayed tuned, I’m sure this top will be making another appearance on the blog soon! Wearing this eyeliner and this blush. Love those shoes! I’d really like to see that top with the red pants too. What a cute + cozy outfit Rachel! i love this look so cute! xO! Whata fun shirt. I love it with the jeans and vest! That vest looks perfect with your striped top! Also, your shoes are amazing! Very cute! Love that top! Adorable look! 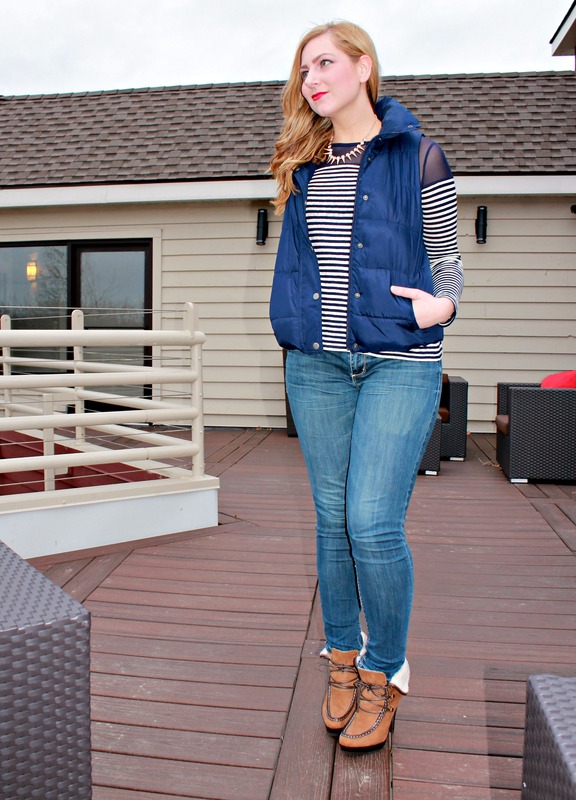 I just love puffer vests… Would love for you to check out how I styled mine: http://palmandpeachtree.com/2014/03/25/cold-snap/. 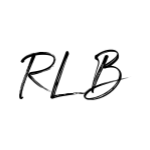 Sadly I think my cold weather days are over for now… So glad I found you through your comment on my blog! Lovee the whole outfit! Those boots are everything! And that red lip looks amazing on you ! It is makes you feel any better it is in the low 50s in Texas today and nasty rain…it was 80 this weekend!! Driving me nuts!! You looked cute regardless and how fun are those shoes!?! Very cute look! I love the striped tee! And yes, kind of sad it’s so cold again. Come back spring! Great look! I love puffer vests! Hi 🙂 You look too cool, girl!!! I loooove your boots and this nice necklace! This top is really cute, so fun and different! Holy Smokes, you look amazing!! Glad you had such a nice weekend! Love this look! That vest is fabulous! The strip top is great and shoes are very cool! Could you be any cuter with your hair blowing in the wind?! Great necklace too!! Love your necklace and lip color! You look great! Love your spiked necklace with the stripes! 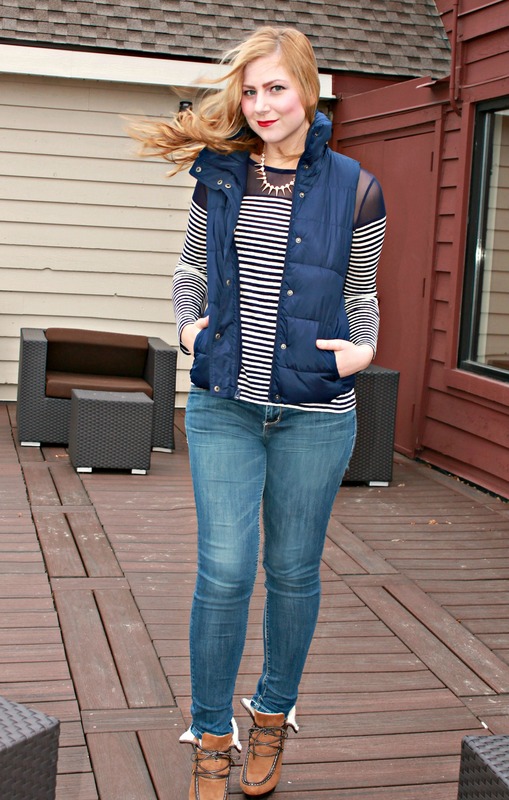 The puffer vest is a great layering piece! The past few days have been warm here but it looks like I’ll need my winter jacket again tomorrow. What a babe! 🙂 Love how you styled this vest! The sheer parts of that shirt make is even more prettier! I love Front Row. They have such modern and edgy clothing! Super cute top! Love this look! Your lip color is STUNNING. I love your striped top. The sheer panels are so pretty. You can’t go wrong with a classic stripe, and I bet the vest kept you super warm! It’s always fun to experience the traditions of other families, everyone does things so differently! Thank you! But you totally can pull it off! I always thought I would look horrible in one (like how do people look chic and not bulky?) It surprisingly isn’t too hard! I think for me, a heeled boot or bootie helps! Super cute! I love that striped top! Love that top and that vest! Such a cute combo! so so cute! the stripes and vest are fab! Cool look! I love your top and necklace! Everything goes together so well! you look gorgeous! i love this outfit and those heels with it are just awesome! you are rocking this look! This is such a cute cold-weather looks! (And I’m sorry spring hasn’t sprung up there yet). Your sherling-trimmed booties are adorable! Very nice! Love the fit of the jeans! What a great outfit combo. Styled wonderfully! I especially love the last photo of you (wind blowing). With a little urge for Spring to stay I posted a new outfit titled "Miami Style"
super duper cute! i wish it wasn’t too warm for me to wear my puffer vest tmw. love this look. You look so gorgeous Rachel and I cant stop looking at those amazing shoes! great look my dear , do yoo want to follow each other ? 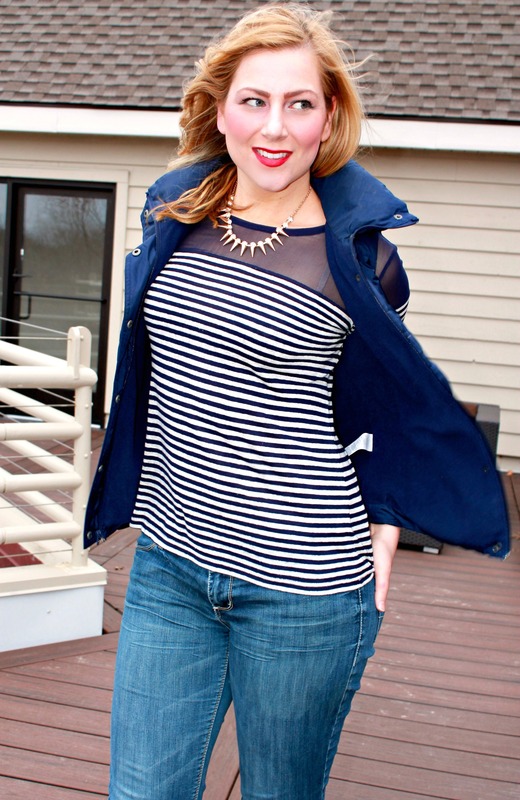 I love a great casual striped top, this one is great paired with the puffer vest. Looking good! Oh I’m in love with your outfit! It looks so great on you Rachel 🙂 Lovin your shoes! so cute and totally appropriate for the weather! That lip pencil was the first thing that stood out to me – it is soo pretty on you. I love those puffer vests, but I always feel a little boy-ish wearing them. This is a really good way to cutesy it up! Thank you darling! I was fortunate enough to try out the BITE pencils last fall and love this color the most! Also, I completely agree. This is the first puffer vest I have ever OWNED because I always felt it made me look too boyish or bulky. Thanks to so much inspiration from fellow bloggers, I was able to wear it a lot this winter and still feel stylish 🙂 Also SO comfortable, now I want one in every color lol! That necklace though! Very fierce. Adds just the right amount of glam without over-doing it! The sheer + stripes on the top = perfect top! Love your booties too! Oh my gosh, i feel you girl. HOW IS IT THIS COLD IN APRIL!? You still managed to look perfectly springy!! Hi Rachel. It took me a while to find where to comment – so many comments wow!. Thank you so much Ada! The red lip was to help with the fact that it was so cold out 😉 Always makes me feel better! And isn’t this striped tee so fun?! Definitely my fave. I feel like I should probably go buy some other striped tees though too, especially for work! Haha, I know right?! We are getting there…. soon I hope!